Look around: the largest migration in human history is under way. For the first time ever, more people are living in cities than in rural areas. Between 2007 and 2050, the worlds cities will have absorbed 3.1 billion people. Urbanization is the mass movement that will change our world during the twenty-first century, and the "arrival city" is where it is taking place. The arrival city exists on the outskirts of the metropolis, in the slums, or in the suburbs; the American version is New Yorks Lower East Side of a century ago or todays Herndon County, Virginia. These are the places where newcomers try to establish new lives and to integrate themselves socially and economically. Their goal is to build communities, to save and invest, and, hopefully, move out, making room for the next wave of migrants. For some, success is years away; for others, it will never come at all. As vibrant places of exchange, arrival cities have long been indicators of social health. Whether its Paris in 1789 or Tehran in 1978, whenever migrant populations are systematically ignored, we should expect violence and extremism. But, as the award-winning journalist Doug Saunders demonstrates, when we make proper investments in our arrival citiesthrough transportation, education, security, and citizenshipa prosperous middle class develops. Saunders takes us on a tour of these vital centers, from Maryland to Shenzhen, from the favelas of Rio to the shantytowns of Mumbai, from Los Angeles to Nairobi. He uncovers the storiesboth inspiring and heartbreakingof the people who live there, and he shows us how the life or death of our arrival cities will determine the shape of our future. Doug Saunders is an award-winning journalist and the European bureau chief of The Globe and Mail. He lives in London. "A brisk world tour of enormous urban-fringe neighborhoods populated by people who have left the countryside, among them Tartary, in west-central Poland; Kibera, in Nairobi; and Petare, in Caracas . . . Perhaps because Saunders is a journalist who isnt selling his advice, his version of the city is . . . more persuasive." "Saunderss success stories tend to begin with benign neglectas the arrival city takes its emergent form, dense and improvisedand to end with carefully tailored state interventions. These efforts typically go well beyond legal measures like title granting, he notes, to include a wide and expensive range of government-funded services and supports. One does not need to be a cynic, alas, to suspect that cities and nations may not apply their best policies to their worst neighborhoods. But for those who are wise enough to try, Saunders has written the manual." "[An] excellent account of how urban immigrant centers function in increasingly subtle ways, and how governments succeed and fail in managing them. . . . Arrival City asks that we take a closer look at urbanization before its mismanagement is further mistaken for the thing itself, and to recognize that a citified future is not necessarily a doomed one." "Serious, mightily researched, lofty and humane, Arrival City is packed with salient detail and could hardly be more timely. . . . Saunderss optimistic book, which draws on the work of economists, sociologists and urban planners, feels as important in its way as was Jane Jacobss Death and Life of Great American Cities . . . It feels like a game changer; it should certainly be a policy changer." "Life in the arrival city can be fragile, precarious and lonely. It can also be liberating, empowering and the path to economic success and personal fulfillment. Arrival City presents an optimistic and humane view of global urbanization. Lets hope urban planners and politicians pay attention." "With the voice of a seasoned reporter, Saunders writes compelling, first-hand narratives describing the challenges and triumphs of migrant families from across the globe . . . The major contribution of Arrival City is a call to take seriously the needs of immigrant communities in urban areas." "Incisive study of worldwide rural-to-urban migration, its complex social mechanisms and the consequences of institutional neglect . . . Never speculative, Saunders dexterously weaves personal case studiessome of which are practically unspeakable and ultimately overwhelmingwith the broader institutional context. An essential work for those who pay attention to the effects of globalizationwhich is, or at least should be, nearly everyone." "Brilliantly researched, hugely valuable new book. . . . A testament to the value of research and knowledge. . . . Arrival City is a masterpiece of reporting, one of the most valuable and lucid works on public policy published anywhere in years. That Saunders produced it now, as journalism is moving more and more toward the temporary, makes it even more remarkable. As the business he works in strives every day to give consumers less information more often, Saunders does the opposite. He takes the long view. He questions perceived wisdom and finds answers in research, reporting and facts." "[This] book not only ranks as one of the years most engaging and important works of non-fiction. It gives a vital resource to everyone who wants to learn about the pursuit of the public good in an era of challenged or enfeebled nation-states. With sharply written case-studies from the favelas of Rio de Janeiro to the banlieues of Paris and the so-called slums of Mumbai, Saunders shows that the arrival city of informal communities, where migrants from rural hinterlands to urban centres gather, presents not simply one of the worlds most pressing problems. It also offers us the most promising solutions . . . For his part, Saunders extends the debate about globalisation and immigration to embrace the lessons of urban history. In his close attention to the voices of actual incomers  many of them Muslims in Europe, in all their diversity; even more not  he also supplies a hugely welcome antidote to the toxic nonsense about Eurabia."
"Provocative . . . Arrival City addresses the great neglected trend of the 21st century: urbanisation. Travelling across the globe, from Rio de Janeiros favelas to Nairobis slums and Berlins Turkish enclave, Saunders weaves the tales of individual migrants through his vast story, that of the current, final great human movement  involving a third of our species  from the countryside to the city . . . A powerful work . . . But Arrival City is above all a warning. Migration is changing our world, and Saunders believes our reaction to it now will determine whether it can help eliminate poverty or whether it will cause catastrophe." 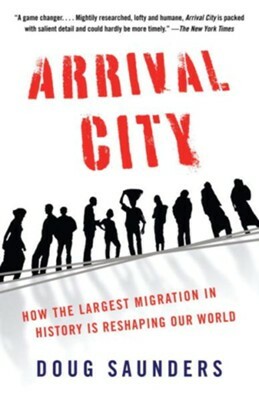 "Doug Saunderss important new book, Arrival City, deals with an unglamorous but bitingly important issue: the largest ever human migration . . . While various academic titles have plumbed this phenomenon, no single book  until now  has breathed such life and human drama into it . . . The book engages while remaining serious. It pulls in the reader by centring its storyline on the fate of its numerous lead characters . . . The book tells a fascinating tale . . . Doug Saunderss greatest strength lies in the global breadth of his reportage, which moves from the alleys of Mumbai to the soulless banlieues of Paris with the urgency of an international spy thriller. His evocative descriptions of open sewers, precarious dwellings, dark, dangerous spaces, noisy slum factories and the indomitable spirit of humanity transform a complex, serious subject into a page-turning read." "The books focus is not the migration itself, but what happens in the cities of arrival . . . Saunderss approach is through anecdotes and vignettes, but he has done his legwork so they cumulate into a persuasive whole . . . Highly readable." "Saunders looks beyond what he sees as a pretty transitional flight and instead focuses, to absorbing effect, on the destination cities . . . Recent books on the phenomenon of mass migration have been riddled with portents of gloom . . . Saunders thesis is far more positive&hellip;Serving as both a wide-ranging examination of the present  and a measured look into the future  Arrival City is an absorbing, enlightening read." "Whats . . . unusual . . . is that Saunderss look at life inside the slums brims with hope, redemption and possibility. . . . Saunders writing style is sumptuous and its clear that he is more portraitist than statistician: he meanders through slums, noting the smells, colours and sounds. . . . By personally acquainting readers with humanity on the margins, it just may open your mind to the aspirations of billions of people that few in the prosperous west take the time to consider." I'm the author/artist and I want to review Arrival City: How the Largest Migration in History Is Reshaping Our World - eBook.